Our fall lettuce—at least some of it—finally is growing in our garden. The Downpour Demons this year frustrated me twice. 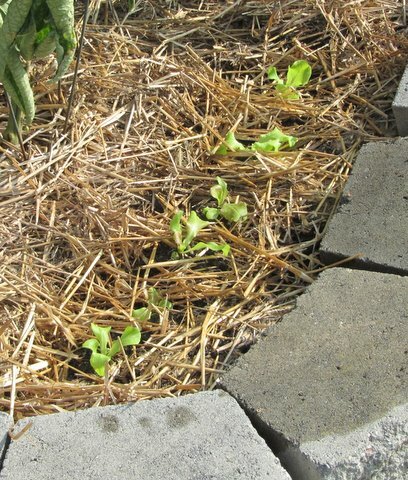 In mid-July I planted a row of Simpsons Curled and Red Sails lettuce seeds for fall harvest. Several days later a series of downpours either drowned the seeds or floated them from our terraced, hillside gardens toward the general direction of the Patuxent River and Montgomery and Prince George’s counties. I planted a second short row a few days later, and within 48 hours the Downpour Demons struck again. However, the Downpour Demons didn’t win the fall lettuce battle. On July 31 I abandoned hope in starting lettuce in the garden and planted seeds in sterile starting soil in cups, kept them well watered but not floating, and protected them from downpours by rushing them onto our front porch whenever I saw a particularly ugly gray cloud approaching. Finally—on Thursday—eighteen days after I planted the seeds in the cups, I set the six transplants out in a sunny spot in the corner of a garden near our row of Brandywine Red tomatoes. I watered them deeply, tucked some of the straw mulch around them, and will keep an eye on them and my favorite bottle of balsamic as I fantasize about the great salads they will make. Have the Downpour Demons taught me anything? Yes, I think it’s much more efficient to start fall lettuce seeds in cups for later transplanting. I think next year I’ll start the process with cups, hopefully frustrating the Downpour Demons and saving me time, work, and disappointment. And maybe I should start a few more cups of lettuce plants to extend our salad harvest well into October. 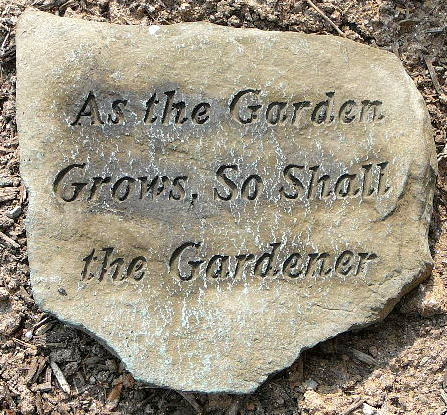 ← So how’s that geographic-themed garden going, hm? Good idea Bob. It seems that all the lettuce I planted also drown. The arugula seems to have weathered the downpours better; go figure.